Yes, that is Dorie’s brioche recipe you see up there. No, it’s not Mary, the Food Librarian’s pick of Banana Bundt Cake, but I had to leave town to take care of a sick relative, and I’m posting things that I made before I unexpectedly had to travel. Thank you, Laurie, for giving us a summer break on the rules. I had some of Dorie’s brioche dough stashed in the Time Machine, also known as my freezer. I thawed it in the freezer refrigerator overnight, then rolled it into a rectangle, filled it with cinnamon, and baked it in a pie plate that I’d coated with brown sugar, butter, and walnuts. Diet food, you see. I am on the Dorie high-butter diet. This time, I just improvised the recipe; before, when I made these, I followed it exactly. The dough had been in the freezer for about five months, and while it had not lost any flavor, it did not rise as much as fresh dough, or brioche that had been frozen for a shorter period of time. Bottom line: next time, I’m going to use up frozen brioche dough within two to three months. 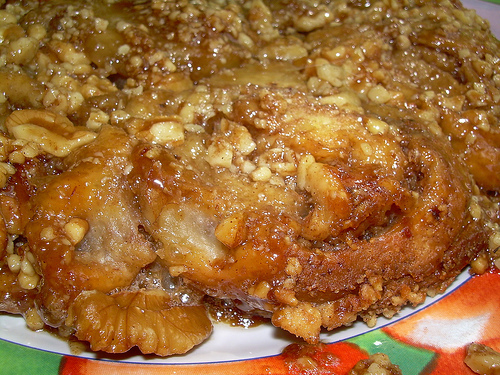 Now, if you go to the blogroll, you can see what people did with the banana bundt cake recipe! I love seeing the creativity and funny stories that everyone has each week. It keeps me laughing. And be sure to check out Susan’s weekly roundup of all things yeasty, YeastSpotting. It is one of the bright spots of my week, particularly when I’m stressed out, as I have been lately. Thanks, Susan! 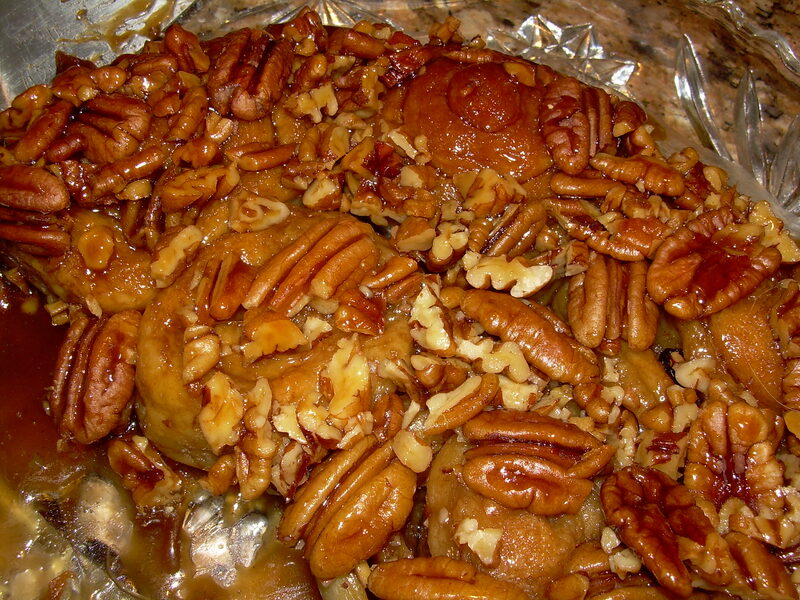 Tuesdays with Dorie – Sticky Buns! Yeah! Oh, I’ve been wanting to make these every since I got Dorie’s book, and I’m so excited that I was able to pick them for my turn. Thanks to all of you for visiting my blog (I love visitors! 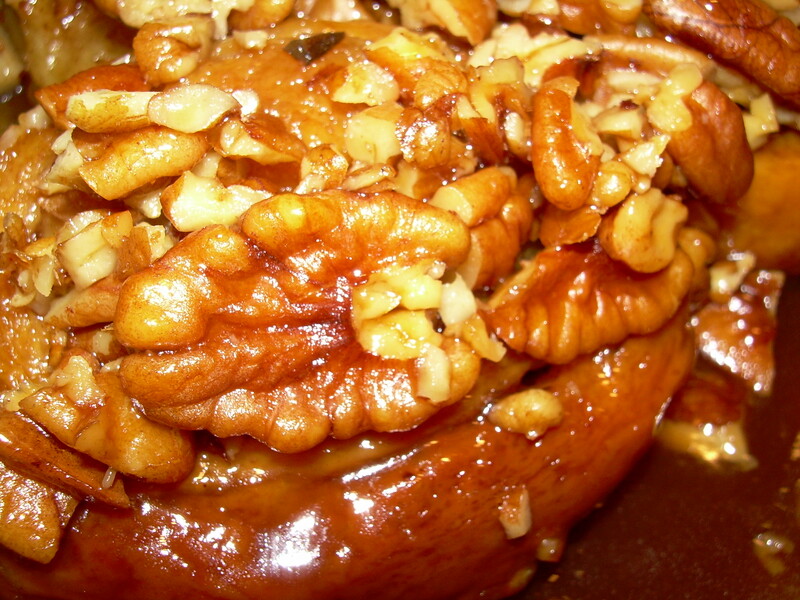 ), to Laurie of Quirky Cupcake for creating TWD, and particular thanks to Dorie Greenspan for writing her many wonderful cookbooks, and for giving me permission to reprint her recipe for Honey Pecan Sticky Buns. Now, I like cinnamon buns, but I LOVE sticky buns. So much so that – are you ready? – I only have them once every couple of years. Yep, you read that correctly. 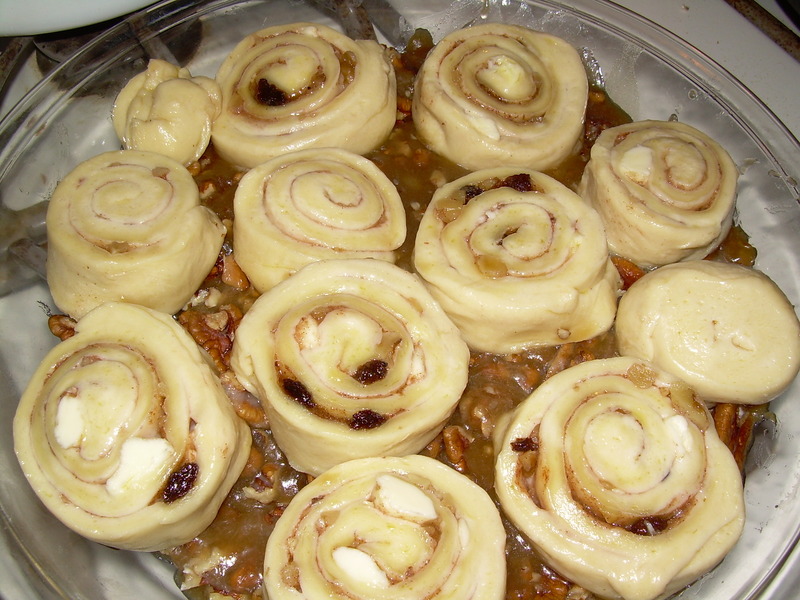 First, because most sticky buns aren’t worth the calories, and second, because I tend to lose control when good ones are around. The operative word here is “good,” and these are very, very good. Even Master Chow, a cinnamon bun devotee, thought these were outstanding, and particularly enjoyed the honey flavor that came through. The caramel was perfect – it did not break by teeth, nor attempt to pull out my fillings. I used a clover honey, and coarsely chopped 1 cup of the pecans, but left the other 1/2 cup in whole pieces. I had a tablespoon of raisins left over from another project, so I threw those in. I ended up with 11 buns (that little nub you see is an end piece), not 15 (and I ended up eating four of them, or was it five? ), so I baked them in a 9-inch Pyrex pie plate, which worked out perfectly. They did take a lot longer to brown than I expected – about 20 minutes longer, in fact. The brioche dough was fabulous. Other recipes that I’ve tried had a very strong yeast flavor, but these rolls had a perfect balance of flavors and textures. Lordie, these were good. Gooey, sticky, crunchy, buttery . . . I could go on, but this IS a family blog. Definitely on the repeat list, and the beauty of the brioche recipe is that I can make a batch of cinnamon buns for Master Chow, and a batch of Honey Pecan Sticky buns. 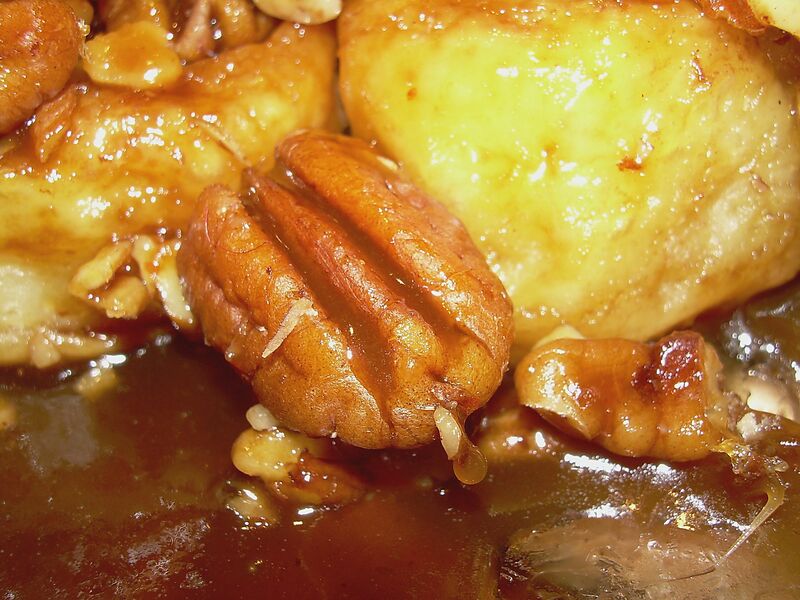 To see how everyone else faired with their sticky buns, check out the TWD blogroll. For next week, Di of Di’s Kitchen Notebook has chosen French Chocolate Brownies. 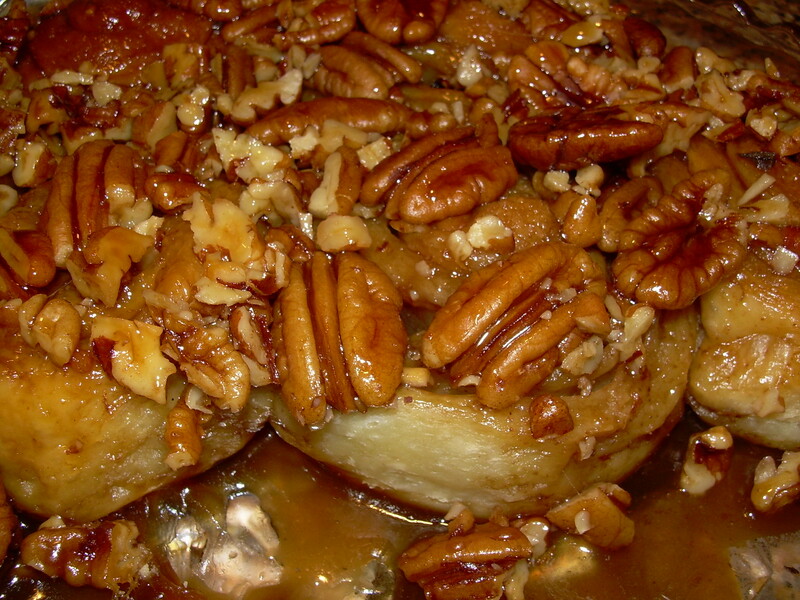 Recipe after the jump . . . .
continue reading "Tuesdays with Dorie – Sticky Buns! Yeah!"